A domestic violence arrest today has far ranging and serious consequences. The laws for domestic violence crimes have gotten much more strict and severe recently. If you have been arrested for a domestic violence assault not only are you facing the penalties that come along with the charge of assault which include possible jail time, hefty fines and probation but you also face domestic violence orders of protection which may prevent you from returning to your home while the case is pending. If you have been charged with a domestic violence assault defend your liberty and educate yourself about your rights by contacting a Stamford domestic violence crimes defense attorney today for a free initial consultation. At the Law Offices of Allan F. Friedman we have empathy and compassion for the difficult situation that you are facing and we understand that you are facing a lot of uncertainly, stress and confusion. One of the most frequently charged Domestic Violence crimes in Connecticut is assault. The best Stamford criminal defense attorneys will agree that assault it is one of the most actively cited statutes for which arrests occur in Stamford and throughout Connecticut. Over the course of my 25 years of practice I have seen many people falsely charged with domestic violence assault who were merely defending themselves against an aggressor who was attacking them. Self-defense is a valid defense to the crime of assault. When Police respond to a domestic violence call in Connecticut they are required to make an arrest if they find probable cause (or evidence) that a crime has occurred. This is even the case if the victim does not want to “press charges.” This is commonly known as our “mandatory arrest law” it takes the discretion away from the Police and forces them to make an arrest in domestic violence cases. Top Stamford criminal lawyers will tell you that this law leads to a lot of victims of domestic violence also being arrested in so called “dual arrests” in which the police arrest both parties without sorting out who was at fault. 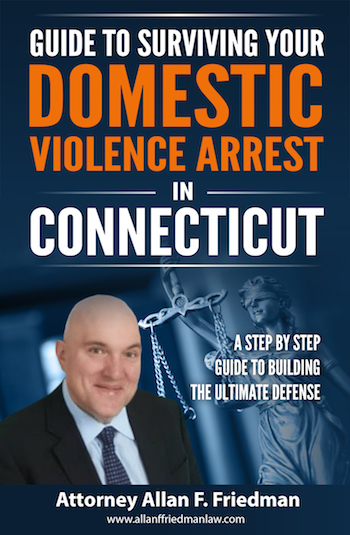 In fact recent statistics indicate that statewide the proportion of so called “dual arrests” is approaching 30% of domestic violence arrests throughout Connecticut. The domestic violence process gets very complicated and overwhelming with protective orders, conditions of release and seemingly endless Court dates to get the case resolved. If you have been charged with assault in context of a domestic violence arrest you should immediately contact a top Stamford domestic violence attorney to help guide you through the process and work to minimize the consequences. Assault 3rd cases make up the majority of the domestic violence assault arrests in Connecticut. In most cases the factual scenario is that a heated dispute escalates into a physical confrontation where one of the parties strikes the other or grabs the other leaving some small mark or bruise. We can see that this crime will be changed anytime that you put your hands on another person in the context of a domestic violence dispute. Do not think that just because the altercation which caused your arrest may have only involved a very slight contact or a very minor injury that this is not a very serious allegation that has some major consequences. A conviction for Assault 3rd would leave you with a permanent criminal record, render you ineligible for most diversionary programs like the family violence education program and the accelerated rehabilitation program, and you could face up to a year in jail and probation, fines and difficulty securing future employment. So, If you have been arrested for Assault in the 3rd degree you should seek the legal counsel of a Stamford domestic violence lawyer at the Law Offices of Allan F. Friedman who can put together the best defense strategy and work to have the charges reduced or dismissed altogether. Although most of the domestic violence arrests involve assault 3rd; there is a significant amount of domestic violence cases which rise to the level of assault 2nd. If you have been charged with assault 2nd it is a very serious crime which is a felony charge, either a class C or a class D felony depending on the facts of the case, and for which you can face up to 5 years in prison, a $5,000 fine and probation. If you have been charged with this crime you need to immediately contact an experienced Connecticut domestic violence attorney to start working on a defense plan right away. If you wait too long witness begin to forget important details and possible exculpatory video surveillance may wind up being erased. If the injury sustained by the victim is non serious it is a class D felony. If the injury is serious it is a class C felony. As mentioned about an arrest for assault in the 2nd degree is going to be handled very seriously by the State’s Attorney and for that reason you will need to be defended by an experienced Stamford domestic violence defense attorney in order to find a positive resolution to your case. The good news is that there are many diversionary programs and education programs now available which may be employed that could lead to a complete dismissal of these charges. The best defense starts with preparation so call today for a free initial consultation so that we can review carefully the facts or your arrest and begin to work on a defense strategy to defend you against these charges. Although this charge is relatively uncommon in domestic violence cases it does occur a few times a year in the Fairfield County. The statutory citation for assault 1st is 53a-59. Generally in the domestic violence area this crime relates to crimes where the actor with intent to cause serious physical injury did do employing the use of a deadly weapon. This is a very serious crime and you could face up to 20 years in prison and a 5 year mandatory minimum jail term upon conviction and a $15,000 fine. If you have been charged with Assault 1 it is time to immediately seek the services of an experienced Connecticut criminal defense attorney for a free initial consultation to review carefully the facts of your case and determine if there is any valid defense to your crime such as self-defense and to evaluate how strong the States’ case is. Defending Domestic Violence Assault Charges What Is a Domestic Violence Criminal Case? The fact that a crime is designated as a domestic violence crime will make it much more complicated and difficult to resolve and domestic violence cases carry much more serious consequences. So, if you have been arrested for a domestic violence assault it is important to speak to an experienced Stamford domestic violence defense attorney at the Law Offices of Allan F. Friedman today. After someone picks up the phone and calls 911 to report a domestic violence incident it sets in motion a process that will continue regardless of the victim’s position or desire to not “press charges.” Upon arrival at a domestic violence crime scene the Police are required to investigate for any sign of probable cause that a crime occurred by looking for any signs of a physical attack such as marks, scratches or bruises. Also the police will speak with any witness who may have seen or heard any altercation between the parties and also interview the parties themselves. As I have said so many times always if you are under Police investigation remain silent and do not answer any questions without the presence of a top Connecticut domestic violence lawyer. If you get a court summons or are arrested for a domestic violence assault the Police will give you on the scene a mandatory temporary protective order that remains in effect until you get to Court . In all domestic violence cases there is a mandatory arraignment on the next day that Court is open so if for example you are arrested on Saturday your Court date will be Monday morning. In most cases the temporary protective order will prevent one of the parties from returning home until the first Court date and / or having any contact with the victim(s). Your best course of action at this point if you can is use your smart phone and do a google search and find an experienced Stamford domestic violence defense lawyer who can bring you up to speed on what to expect on your visit to Court during your next day arraignment, give you some advice on some defense strategies and take any steps needed to preserve any exculpatory evidence such as video surveillance that may exist of the crime. If you are arrested for a change of assault related to a domestic violence case you will be summoned to appear in Court on the next business day. This next day arraignment is required under Connecticut law and is part of the very rigid and strict domestic violence crimes procedure in Connecticut. Under ideal circumstances everyone would hire a Connecticut domestic violence defense attorney to be present to represent them during this critical first Court appearance. At the arraignment hearing the Court will take up and make decisions on several very important matters such as protective orders, the extent of the protective orders and any conditions of release which the Court will deem appropriate. These decisions will have a significant impact upon your life during the next few months while your case is pending. That is why is always a good idea to have a Stamford domestic violence defense attorney by your side when you are attending Court during a domestic violence arraignment. When you arrive at Court for your arraignment the first thing you will do is be interviewed by a Family Relations Officer. When meeting with a Family Relations Officer everything you say can be used against you. It is better to not make any admissions or go into any specific details concerning the allegations about the crime itself. Remain polite, cooperative, friendly and rational but do not discuss details about the crime itself without the advice of your attorney. Ideally, the best plan is to have a Stamford domestic violence defense attorney with you during your meeting with the Family Relations officer to protect you against any forced admissions during the interview. The Family Relations Officer will review the Police Reports and witness statements and any input from the victims in order to make their suggestions to the Court. If Family Relations feels that restraining / protective orders are needed then it will make recommendations to the Court about what level of restraining / protective order are suggested. Finally, the office of Family Relations will indicate whether it will seek to have the case referred to its office for supervision and also if the Office of Family Relations will suggest to the Court to impose some conditions of release upon the defendant to follow while the case is pending. The Domestic violence criminal protective orders that the Court imposes during your arraignment come in 3 different levels. The lowest level is a partial order which means do not harass, assault or annoy the victom. The next level is a called a full order also known as a residential “stay away” order allows you to have contact to arrange visitation for example but which excludes you from entering the victim’s home. The most restrictive domestic criminal protective order is a full no contact which means that you are to have no contact of any kind what so ever with the victim. This means that is the victim calls you need to hang up the phone. The Court will go to great lengths to explain all the details of the order to you during the arraignment but unless you hire a Stamford domestic violence crimes defense attorney to contest or modify these orders they will remain in effect during the duration of the case. The “stay away” full protective orders mean that if you previously lived with the victim (e.g. were married, etc.) then you would have to immediately move out of your home and find an new place to live. This is not only disruptive but it obviously would result in significant costs and expenses in hotel or rental fees. If you have children these orders can result in a lot of disruption to your children’s lives and trauma. It seems more and more common that the Office of Family Relations will suggest to the Court to order that the parties engage in anger management or substance abuse classes or programs as a condition of release. Usually, by the time clients find out what is involved with these programs it is too late. Most of these programs only offer day time classes which obviously do not work for people who have a job and are even worse for clients who work in New York City. This is why it is highly recommended to retain a top Stamford domestic violence defense attorney to be with you during your arraignment to oppose the Court entering orders to require any programs or conditions of release which may pose a hardship upon you. The majority of domestic violence arrests occur during the evening and weekend hours for that reason we are available 24/7 at 203.515.4110. It is recommended to retain a Stamford domestic violence crimes attorney to represent you at your arraignment. In practice due to the very short time limitations between the time of the arrests and the arraignments which take place the following morning most people do not come with lawyers. If you are reading this and you already have had your arraignment and a protective order has issued against you are not alone. There is still hope to modify the protective order and your conditions of release if any. Contact the Law Offices of Allan F. Friedman for a free consultation and start the process to get your charge of domestic violence assault dismissed or reduced and resolve your entire case. All of the top Stamford domestic violence defense lawyers will agree that a domestic violence assault crime case that can be resolved in any number of ways that lead to a dismissal and will leave you without a criminal record. It is best to work with a lawyer who has experience working with domestic violence matters as there are many tactics and methods or resolving these cases while making sure that you do not get a criminal record . Often in minor assault cases in which minor injuries are alleged going through a course of anger management therapy through a Court ordered provider or a private therapist can lead to a dismissal of the charges. Many domestic violence cases can be successfully resolved through negotiation with the state and family relations. In those cases where the allegations are too severe or where victim opposition is so strenuous that the State is unwilling to dismiss the charges outright there are still many other options available which will lead to a dismissal. The Family Violence Education Program is diversionary program which can lead to the dismissal of your charges and leave you with no criminal record. There are two enhanced versions of this program for particularly violent assault allegations the explore and the evolve program which are more intensive and require more classes but both also lead to a dismissal of the charges and no criminal record. In domestic violence cases, I always consider the use of a diversionary program as a last resort after exploring all other available options. In every case I fight to exhaust every available option to get your case dismissed before using a diversionary program. Your first step in every domestic violence assault case is to visit us for a free consultation to discuss the facts of your case. From there we can work to plan the best strategy to defend your case. Let Us Fight Your Domestic Violence Assault Charge! We provide free initial consultations. We have 25 years of Court room experience throughout the State of Connecticut. We will discuss your goals of the representation which are usually a dismissal or a reduction of the charges and any special concerns that you may have . Often working with an experienced Stamford domestic violence assault lawyer can make the difference in having your case dismissed or reduced down to a lesser charge. If you been arrested for Domestic Violence Assault in Greenwich, Stamford, Norwalk, Darien, New Canaan, Cos Cob, Fairfield, Westport, Wilton, Weston, Bridgeport and throughout the County of Fairfield do not hesitate to contact the Law Offices of Allan F. Friedman. We work on a flat fee basis and our rates are reasonable. We offer payments plans as needed. Call Attorney Friedman at 203.515.4110 to schedule your free initial consultation we are available 24/7. Or you can contact us online for a prompt response.